TOKYO (Reuters) - A year into "Abenomics," it was not supposed to be like this for the Bank of Japan. The central bank, its boss hand-picked by Prime Minister Shinzo Abe, shot the first, and so far most successful, arrow from Abe's quiver of aggressive policies to pull the world's third-biggest economy out of almost two decades of deflation and lackluster growth. BOJ Governor Haruhiko Kuroda's massive burst of money-printing - almost $70 billion a month - has driven the yen down and Tokyo stocks up. It has also spurred the strongest economic growth among G7 countries in the first half of the year, arresting a long fall in consumer prices. But now, 12 months after Abe was elected and eight months after Kuroda announced the big-bang stimulus package, financial markets are looking for more stimulus - already dubbed "JQE2", or Japan's second round of quantitative easing. Economic growth slowed sharply in the third quarter and while inflation is at its highest in five years, it is well short of the BOJ's price target and the outlook is weakening. Private economists and half of Kuroda's fellow board members are openly skeptical of the BOJ's rosy growth and price forecasts. So bureaucrats in the BOJ are actively game-planning scenarios for further easing, such as increasing purchases of stock market-linked funds or buying other assets riskier than the Japanese government bonds (JGBs) it now gobbles up in huge quantities, officials briefed on the process say. "There's no sense that further stimulus is imminent," said one of these officials, adding the central bank's inflation target is still a long way off. "There's no harm in thinking about options." Elsewhere within the central bank and among government officials who deal with the BOJ, more radical ideas are being floated, including even more aggressive purchases of JGBs - a market already dominated by the central bank's money machine. The easing to end all easings in April was a jolt to financial markets, promising what Kuroda calls the "global standard" of 2 percent inflation in two years. It was meant to end the perception that the BOJ was forever behind the curve, chasing the expectations of investors and under pressure from politicians to do more. But Kuroda is being dragged back into the expectations game that bedeviled his predecessor, Masaaki Shirakawa, who oversaw a steady drip of stimulus measures that always seemed a step behind market expectations and government demands. Central bank officials say they will not have enough data to decide if further easing is needed until at least the middle of next year, but markets are looking for a move as soon as April, when the BOJ produces its next growth and price forecasts. Some government officials, including those close to Abe, even speculate on an easing before that - another shock-and-awe move meant to pre-empt the economic drag from an increase in the national sales tax to 8 percent from 5 percent on April 1. Kuroda reiterated on Monday there is no need to change the target and a person close to him recently said the governor appeared just as optimistic in private. But Kuroda also left his options open, telling business leaders in the central Japanese city of Nagoya that overseas economic uncertainties are among key risks for the BOJ's policy. "Of course, we are ready to adjust monetary policy without hesitation if upside or downside risks materialize," Kuroda said. Four of the nine BOJ board members, economists by training, are either dissenting on policy votes or publicly casting doubt on the BOJ's forecasts. And the pessimists disagree among themselves: two have called for watering down the BOJ's inflation target as too ambitious for a country that has been mired in deflation for 15 years, while the other two appear more inclined to ease further if needed to hit the inflation target. Doubter Sayuri Shirai said last week she saw no need to expand stimulus right away, but she and another pessimist, Ryuzo Miyao, have both recently fretted that Japan's economic risks are now tilted to the downside, mainly because of concerns that global export demand remains fragile. The view from planners inside the bank is that - barring some economic shock - next April's growth and price forecasts will not be enough to alter the BOJ's policy trajectory, especially as the economy is likely to be booming as consumers buy to avoid higher prices later when the sales tax rises. The board might start to consider fresh stimulus, the officials with knowledge of BOJ thinking say, if data from July onwards shows that the tax hike is hitting the economy harder than expected. An abrupt yen rise, say to 95 per dollar from around 102 now, or the outcome of spring wage negotiations and fiscal considerations could all weigh on BOJ policy decisions next year, these officials say. A former top BOJ official said the bureaucrats could finesse the bank's message on the economy and policy and stave off a policy shift until that happens, even if the central bank's baseline assumptions are crumbling. A subsequent trigger could come later, when the central bank updates its forecasts in October. 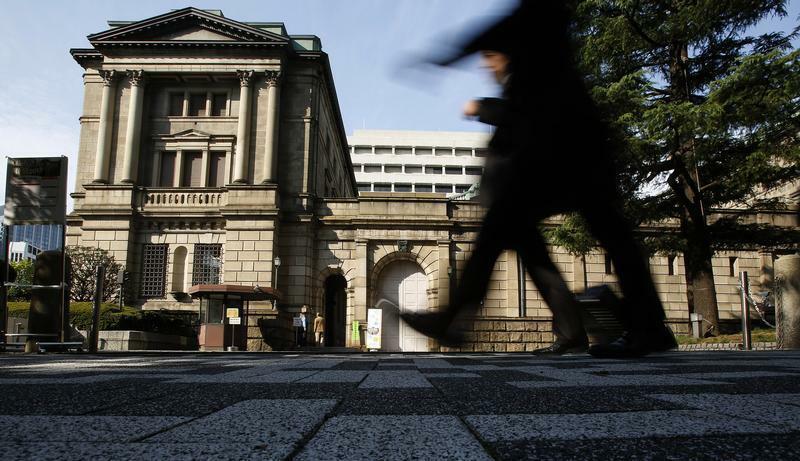 Either way, the BOJ has a fine line to walk to avoid undermining its credibility. "Easing too soon would destroy the BOJ's current QE framework, which is based on the assumption the bank won't act incrementally," the former top BOJ official said. But speculation is rising, in the markets and among some in the government and central bank, of an pre-emptive policy strike. "They won't move now, but they will before the April consumption-tax hike," former BOJ board member Nobuyuki Nakahara, a confidante of Prime Minister Abe, told Reuters. "I think they'll want to do them as close together as possible." The timing, in fact, may be determined more by Abe's government because the BOJ "is now under the control of the cabinet" said a person in close contact with both the BOJ and Abe's office. Under its current policy, the BOJ buys 7 trillion yen ($68 billion) of JGBs a month, equal to 70 percent of new government debt issuance. The idea is to flood the financial system with cash while at the same time holding down interest rates to boost economic activity and generate moderate inflation. The central bank also buys riskier assets, such as exchange-traded funds, corporate bonds and real-estate trust funds. Boosting purchases of ETFs - securities that track the broader stock market - is emerging as the preferred choice for BOJ officials quietly making contingency plans in case the board decides to ease, the officials briefed on the process say. The planners see an increase in purchases of such risk assets as a more realistic option than buying even more JGBs because the BOJ already dominates the debt market. ETFs make up a bigger market in Japan than other assets such as mortgage-backed securities - a favored buying target of the U.S. Federal Reserve under its stimulus program. Another possibility would be to increase the amount of funds the BOJ offers to banks under several existing loan schemes, which could be explained as a move to encourage banks to lend more instead of sitting on cash piles, the officials said. One of the officials said any further easing could focus more on quality than quantity - taking up more risk rather than simply bolstering the size of purchases. "It's hard to exceed in size what the BOJ delivered in April," this person said. "There may be a need to shift from the approach of aiming for the size effect." Tadashi Matsukawa, head of fixed-income investment at PineBridge Investments in Tokyo, said the volume of bond trading in five-year and 10-year maturities had already dried up because of the BOJ's massive buying. "So investors don't want the BOJ to buy them from the market," Matsukawa said. Even if the BOJ increased its JGB purchases, life insurers probably would not sharply reduce their bondholdings because they want to hold domestic bonds to match their long-term liabilities, analysts say. But banks, another major JGB holder, may be reluctant to release their bonds unless the BOJ pays top price. JGB holdings of Japan's big banks hit a 3 1/2-year low in October as they continued selling bonds and parked cash at the BOJ, central bank data showed on Monday. But the shift has diminishing returns as their BOJ deposits earn just 0.1 percent and 10-year JGBs yield 0.6 percent. Some proponents of a second Kuroda big bang say the BOJ should focus on JGBs exactly because of the arresting effect it would have, driving prices up high enough to pry the bonds out of the biggest portfolios. One goal shared by Abe and Kuroda is to pump money out of JGBs and into more productive uses or risky purchases - without letting bond yields spike. The debt market suffered turbulence for a month or so after the easing was announced in April but has since slipped into a stupor as the BOJ buys the bulk of the market. But increasing JGB purchases is not without risks. A widely shared view in the BOJ is that sharply increasing JGB purchases could unleash a bond selloff because the central bank could be seen as giving the government a blank check, which would fuel concern Japan was losing control over its already enormous debt. Kuroda told Parliament on Friday that he had "absolutely no plan" to use monetary policy to monetize public debt.